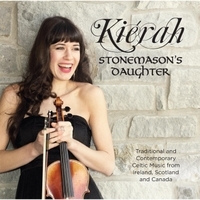 “Stonemason’s Daughter” is a beautiful album demonstrating Kiérah’s heartfelt love of traditional and contemporary Celtic music. It features many of her unique and challenging compositions played by Kiérah on fiddle, Adam Dobres on guitar, Adrian Dolan on piano, mandolin, mandola and accordion. Guests: Daniel Lapp – banjo, Martin Nolan – whistle, Paul O’Brien – bodhran. After spending the summer in Ireland and immersing herself in the music, culture, language and history, Kiérah returned home with a greater love and appreciation for Irish music. So much of what she learned and felt is reflected on the album providing a fresh take on traditional tunes. The music showcases Kiérah’s proficiency and versatility as a fiddler and as a composer in Celtic and Classical traditions. “Growing up the youngest of 7 children, Kiérah must have felt the real need to stand out, and stand out she does with her new album. It’s not just her technical prowess as a traditional fiddler that makes “Stonemason’s Daughter” note-worthy, it’s her touch with the old tunes and her taste for composing new ones”.